Art is around us everywhere. Books frequently reference Michelangelo’s masterpieces, pop culture doesn’t tire of Andy Warhol’s “Marilyn Diptych” and the “Mona Lisa” seems to have a doppelganger in every decade. But art goes beyond what we see in mass media. People can showcase and examine it in intimate settings to stir emotion, inspire creativity and fuel motivation. If you love color and are looking for paintings that will do more than fill a space, then find inspiration in the passionate hues of these five impressionist and post-impressionist artworks by exhibiting them around your home or office. This painting is said to have started the impressionist movement. Its rapid and seemingly effortless brushstrokes capture the momentary beauty of daybreak and exude a sense of optimism and vitality. These subtle yet provocative orange and blue hues can set the tone for a new day and a fresh start. Place it in a space visible from your bed so it’s one of the first things you see when you wake up. This soothing illustration of Parisian leisure on the Seine River alludes to the idea that life is a stroll in the park. The vibrant red, warm sage and cool green shades were created through pointillism, a technique where millions of small dots systematically form shapes the eye can recognize. It depicts a calm, colorful atmosphere settling in as Parisians softly gaze into the distance and share quality time with loved ones, creating a permanent moment of relaxation. When you need to unwind in your home, this can be your go-to visual. 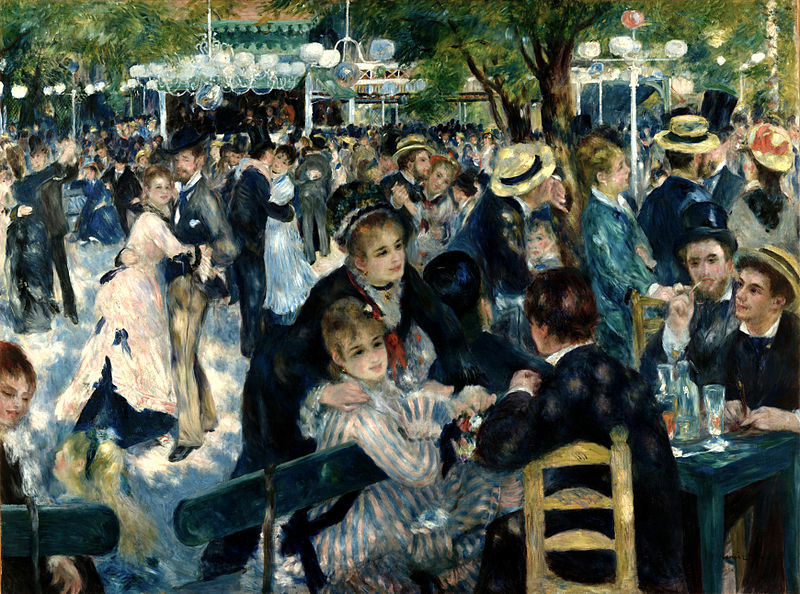 Renoir used soft, almost untraceable brushstrokes of yellow and peach tones outlined with bold, dark details to create a bubbly atmosphere where friends sip champagne and lovers unite on the dance floor. In this never-ending party, the fervent sun trickles through the trees and fills the painting’s subtle colors with a hazy light. This artwork showcasing healthy friendships and an elegant social setting is a great piece for a living room or family dining area. People sometimes describe post-impressionist painter Vincent van Gogh as a tortured soul. His mental health issues made his life difficult, but they also allowed him to see in vibrant, active colors. With its thick, rapid brushstrokes and contrasting cool blue and warm yellow colors, “The Mulberry Tree” generates thoughts of branching out and reaching for the sky. The tree’s extended limbs imitate open arms ready to embrace new opportunities. Place this simple yet tremendously powerful painting in an office to awaken a positive attitude when you walk through the door. Paul Gauguin, a frenemy of van Gogh, calls on the prismatic residents of Tahiti to illustrate the basic question, “What’s my purpose?” With its saturated blue and yellow hues and stimulating characters, this painting takes you back a few centuries to depict how far humanity has come. It ignites the question, “How far can I go?” The painting’s intimate setting and revealing nature makes it a great stable, thought-provoking piece for a wide wall in a bathroom.